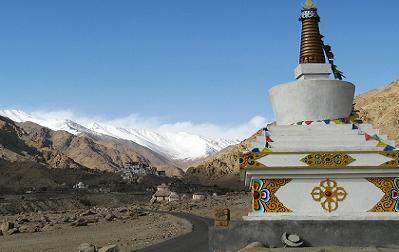 Likir is a small town situated in Ladakh, which is part of the state of Jammu and Kashmir in India. 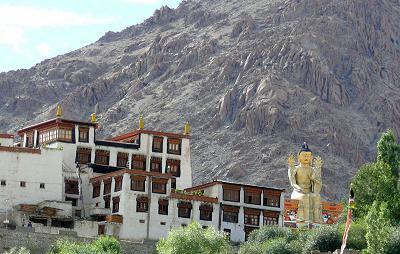 It is perhaps most well-known for the nearby Klu-kkhyil (meaning "water spirits") Gompa. The Likir Monastery was first constructed in the 11th century and was rebuilt in the 18th century, and currently has a 25-foot-tall (7.6 m) gold-covered Buddha statue.It is occupied by monks of the Gelukpa order. 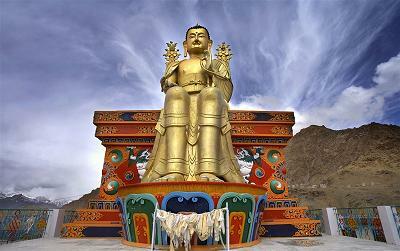 It is positioned 52 km from Leh. Khalatse is a nearby trekking place. Likir Monastery or Likir Gompa (Klud-kyil) is a Buddhist monastery in Ladakh, northern India, situated about 52 kilometres (32 mi) west of Leh.It is picturesquely located on a little hill in the valley near the Indus River and the village of Saspol about 9.5 kilometres (5.9 mi) north of the Srinigar to Leh highway.It belongs to the Gelugpa sect of Tibetan Buddhism and was set uped in 1065 by Lama Duwang Chosje, under the command of the fifth king of Ladakh, Lhachen Gyalpo (Lha-chen-rgyal-po).Although Likir now seems rather out of the way, it used to be on a major trade route which is travelled via Tingmosgang, Hemis and Likir to Leh. 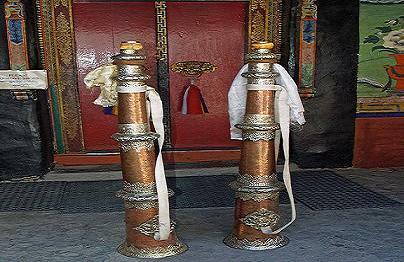 Likir is mentioned in the Ladakhi records as having been erected by King Lhachen Gyalpo. The name Likir means "The Naga - Encircled", representing the bodies of the two great serpent feelings, the Naga-rajas, Taksako and Nanda. It originally belonged to the early Kadampa order of Tibetan Buddhism. When Francke visited the monastery in 1909 he was shown a long message written in black ink on a wall which summarize the history of the monastery. 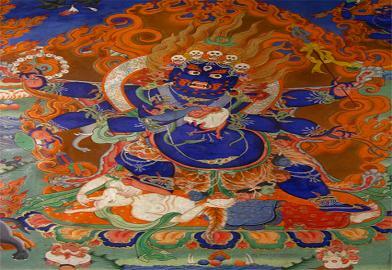 Francke had it copied and interprets it as follows:"King Lha-chen-rgyal-po constructed the monastery in the 11th century. In the 15th century, Lama Lha-dbang-chos-rje [a famous pupil of Tsongkhapa] converted the lamas to the reformed doctrines of the Ge-lug-pa order, and thus constructed the monastery afresh as a Ge-lug-pa establishment.Then it is stated that seven generations after Lha-chen-rgyal-po, King Lha-chen-dngos-grub arose, and that he launched the tradition of sending all the novices to Lhasa. This statement is found in exactly the same words as we find in the Gyal-rabs"
The monastery was a large chorten with frescoes inside which represent Tsongkapa and other lamas of his time. "Painted above the door, a very strange figure is found which looks much like one of the normal representations of Srong-btsan-sgam-po (Songtsän Gampo).The figure wears a three-pointed hat of white colour and carries two leopard skins under his arms." 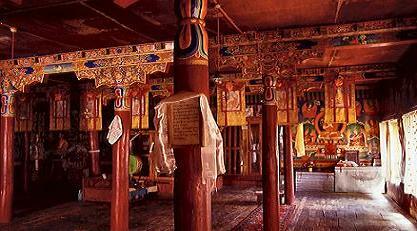 The lower part of the chorten is a square room which a lama said was the earliest temple at Likir, and was already there when King Lha-chenrgyal-po founded the monastery. 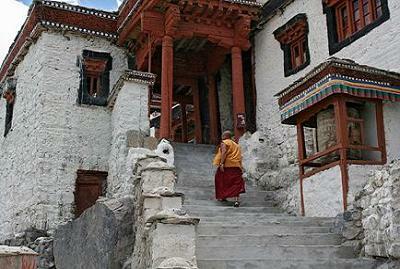 The monastery presently has about 120 Buddhist monks and a school, in which almost thirty students study. The Central Institute of Buddhist Studies runs it and teaches in three languages, English,Hindi and Sanskrit. It also serves as the venue of an annual event Dosmochey, the assembly of votive offerings and sacred dances which takes place on the 27th day to 29th day of the 12th month of the Tibetan calendar. 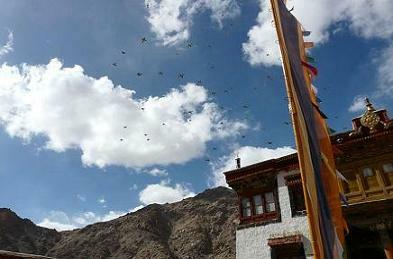 It is the seat of the Ngari Rinpoche, the present emanation of whom is the younger brother of the Dalai Lama. Although he does not permanently reside here, he attends for the more significant pujas. 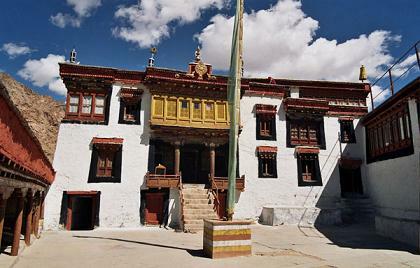 The monastery has two assembly halls, known as Dukhangs and the older one is situated on the right of the central courtyard with six rows of seats for the lamas and a throne for the Head Lama of Likir.The Dukhangs contain statues of Amitabha ,Bodhisattva, three large statues of Maitreya ,Sakyamuni, and Tsong Khapa, founder of the yellow-hat sect.The verandah has thangka paintings of the Guardians of the Four Directions and wheel of life mandala held by Yama and the courtyard has a large Jupiter tree, a rare species.The Dukhang contains glass-fronted bookcases holding the Thandshur and the Kandshur and two rolled-up thangkas hang from the beams close to entrance which contains pictures of Sakyamuni and Likir's guardian divinity. 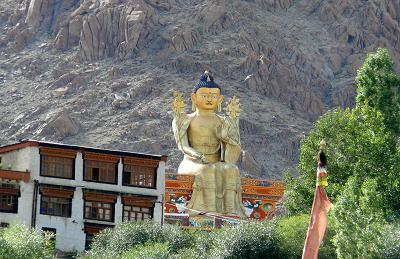 The monastery is also a storehouse of old manuscripts, the monastery has a notable thangka collection and earthen pots and old costumes.Sitting on the roof is a 23 metre (75 ft) high gilded gold statue of Maitreya (the future) Buddha.It was completed in 1999. The newer Dukhang, about 200 years old is situated diagonally across from the courtyard's entrance and contains a statue of Avalokitesvara with 1000 arms and 11 heads. Bookcases stand at the statue sides, with the volumes of the Sumbum, describing the life and teachings of Tsong Khapa.The left wall has paintings of the 35 Confessional Buddhas while the right wall has an image of Sakyamuni with two of his chiefs by his side. 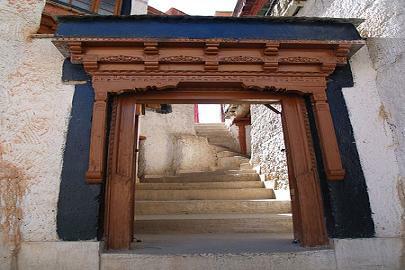 A ladder leads out of the hall, followed by a doorway into the courtyard which in turn leads to the Zinchun, which is the head lama's room which contains mainly thangkas and images of lamas and the 21 manifestations of the White Tara, the consort of Avalokitesvara.Then there is the Gonkhang room which is devoted to the guardian divinities which is accessed by descending the stairs outside the courtyard of the head lama's room. 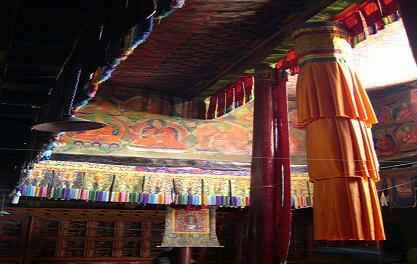 The Gonkhang was created in 1983 when the monastery underwent renovation and was completed a year later. 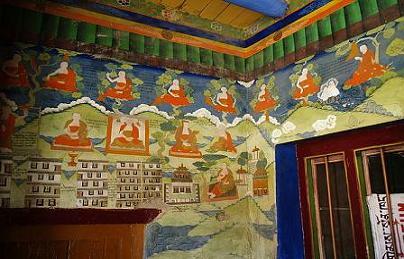 The walls of the Gonkhang include thangkas of the divinities as does a glass-fronted room in front of the Gonkhang. 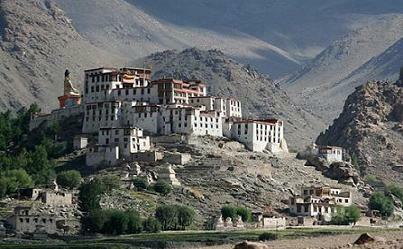 The monastery is positioned on top of a hill alongside the valley of river Indus. The valley has agricultural fields at the lower level and the monastery complex occupying the high grounds. The main temple is roughly at the highest plateau of the hill. The complex itself consists of the assembly hall , the monk’s quarters , the main temple, and services such as dining and kitchen as its identifiable parts. The parts of the complex has been modified and built over a long period of time, and its present state suggest a well compact,equipped and strategically sited monastery.